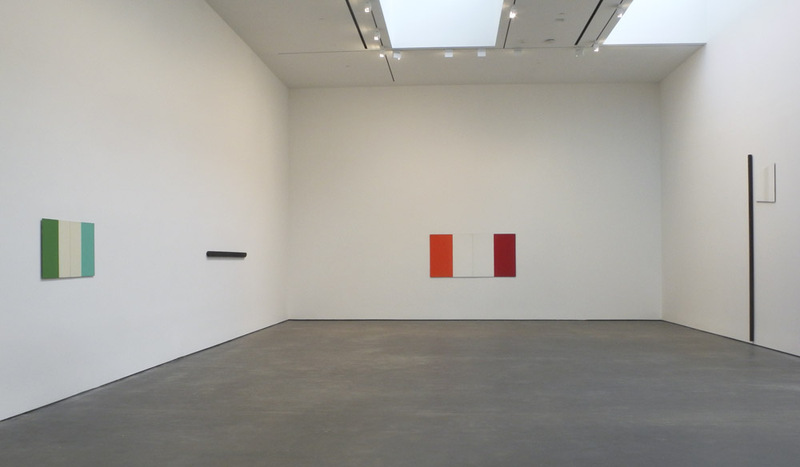 Installation view of the exhibition "Palermo: Works 1973 - 1976" at David Zwirner Gallery. I have a passionate love for all the work of Blinky Palermo (1943-1977), the German artist who took the name of an American gangster/fight promoter and lived a short and very productive life. I use the word passionate deliberately, as it implies a highly emotional, almost irrational response. It's difficult to describe clearly why Palermo's work moves me and makes me happy to be in its presence, as I was at the recent show at Zwirner, link above. I suppose I can start with minimalism, pared down, mainly geometric painting, which I love, and which has influenced much of my work the past few years. 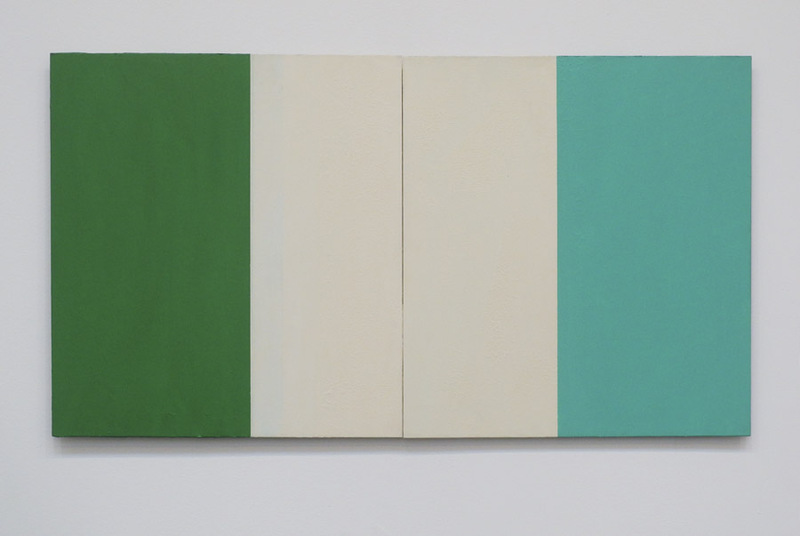 I'd have to include Palermo's work within the frame of minimalism, but he throws a curve ball into the mix. Looking at the long black line on the left wall, I see that it has some weight and presence, but it's not quite a sculpture. 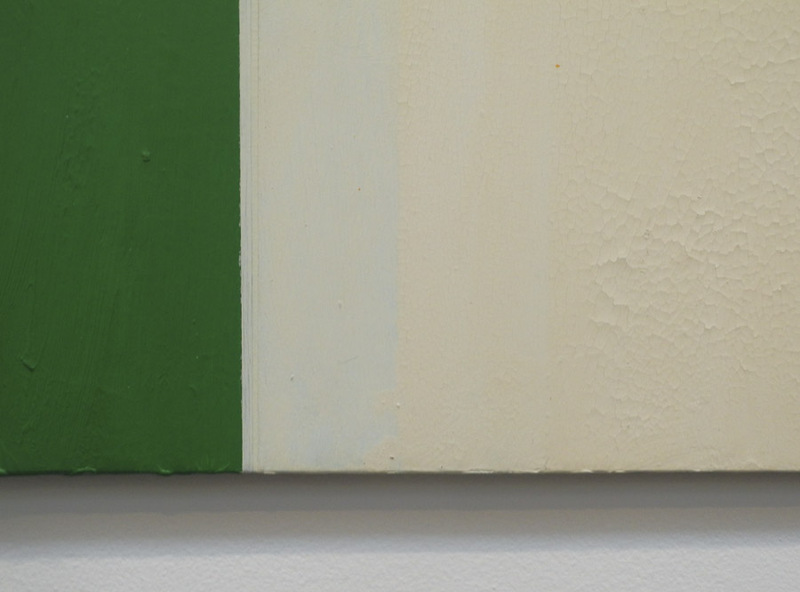 Untitled, 1973, detail; oil on canvas over wood, 3 1/2 x 88 3/8 x 1 9/16 in. It is, rather, a long narrow, irregular painting, pointed on both ends so as to push into the space around it, animating the wall. The surface isn't polished and smooth, but bumpy and somewhat misshapen. I find this imperfection very touching, and the emotion is heightened for me by the ordinariness of this object placed on the wall: it is a line, and a hand-formed object, inviting metaphor. 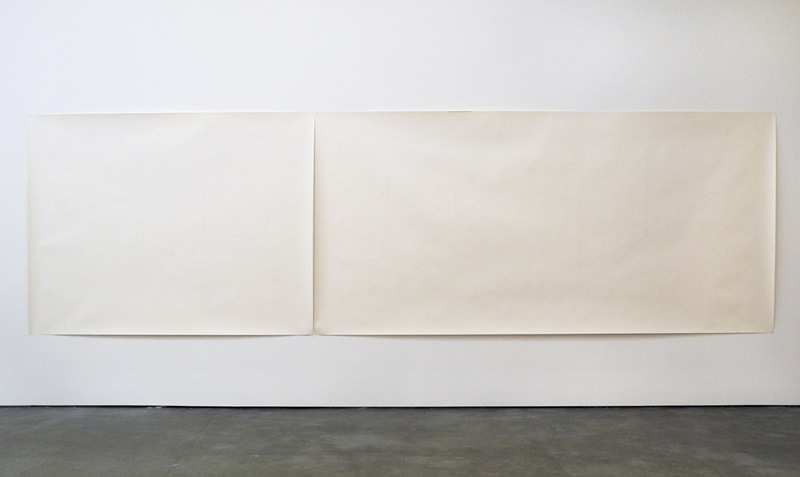 Wooster Street, 1975; acrylic on aluminum in 2 parts, 22 1/2 x 41 5/16 overall. There were two of Palermo's metal paintings in the show. The thin metal surfaces of the paintings gives them a lightness on the wall despite their strong presence and moves them outside the familiar oil-on-canvas tradition. The care with which white paint was laid over the darker color, making subtle stripes, belies the idea that the artist might have been a sloppy thinker. 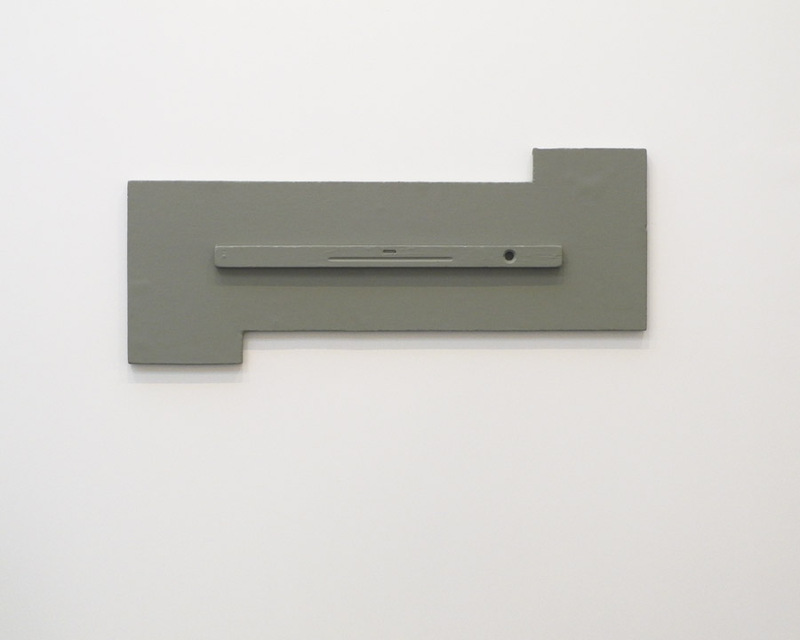 Untitled, 1973; primer, oil, fabric, and wood; 98 7/8 x 26 3/8 x 3 5/8 in. Palermo called his hybrid works of painting in three dimensions "objects". They are painting amplified. 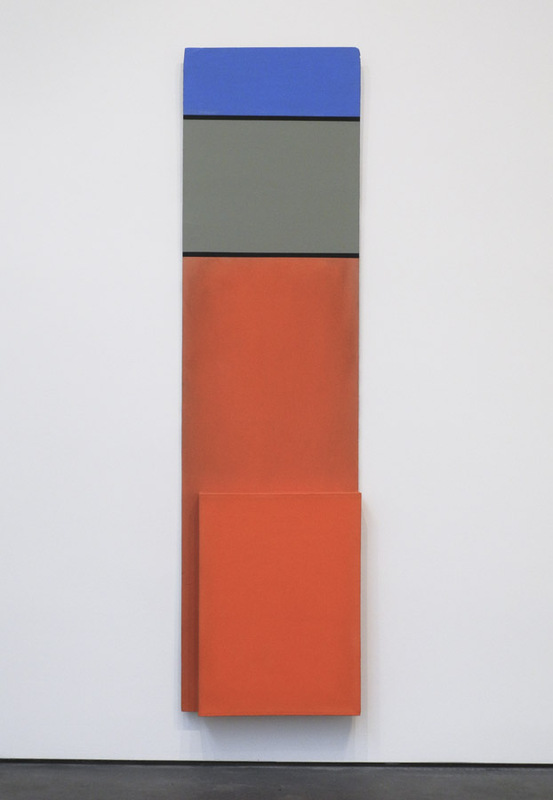 In the piece above, a dirty red-orange supports gray and bright blue on a tall, thin rectangle. At the bottom another orange rectangle is layered. It is very difficult to achieve balance with such a tall shape, but this work feels achingly perfect to me. White Wing, 1974-75; protective wood paint and mixed media on wood with acrylic on aluminum, 119 7/8 x 35 1/16 x 1 15/16 in. overall. 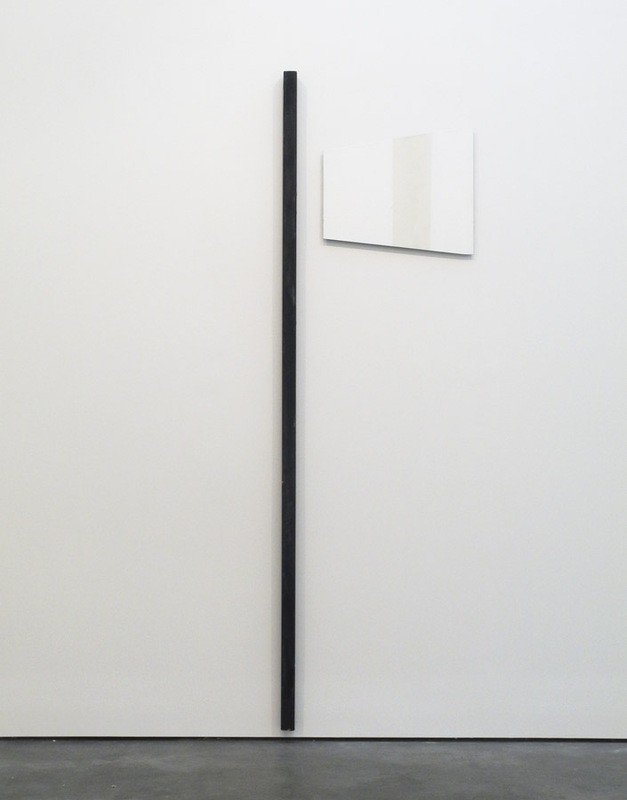 A simple black line and and a white parallelogram washed with a stripe of pale color: a combination offering numerous metaphors. White Wing is dramatic in its actual presence, being 10 feet tall, engaging a sweep of wall. You can see its scale in the first installation photo above. 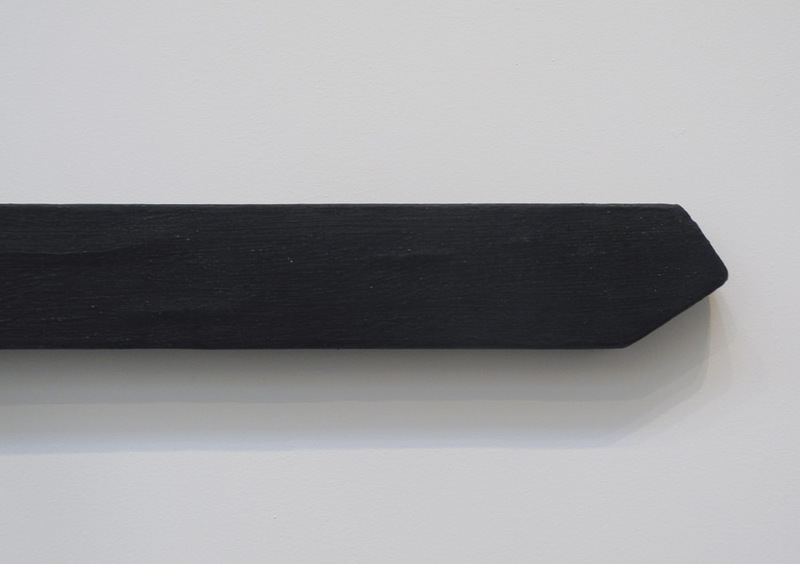 The tall black shape isn't a simple flat line, but a slightly volumetric wood form, roughened and marked by paint and staples. What appears from a distance as a clean, crisp form is instead worn and speaks of time and the hand. 21 3/8 x 53 1/2 x 1 3/4 in. This work is quite witty, I think. 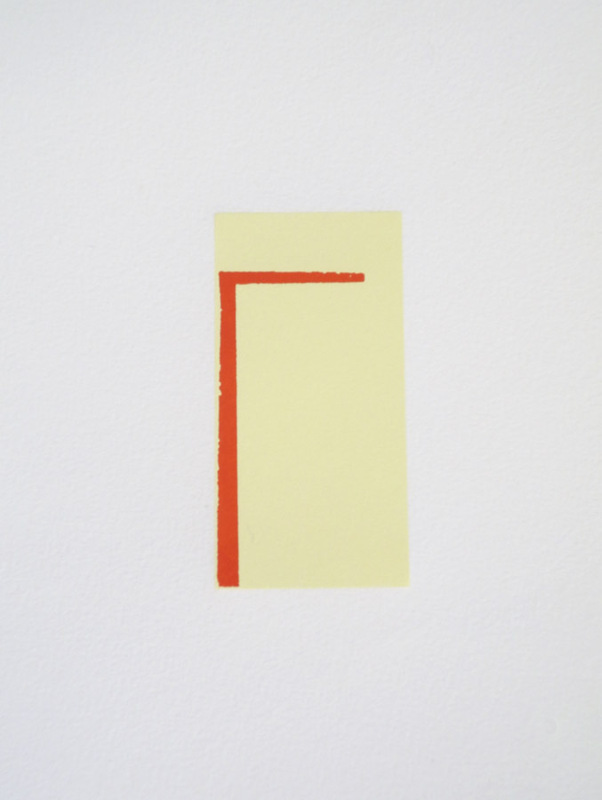 Two implied vertical rectangles bookend a horizontal one, and on top is a spirit level, painted the same way as the board beneath. I had never realized that a level was also called a spirit level; to me it implies some kind of magic. In this case, the level is missing the liquid and its bubbles, so it cannot measure its straightness on the wall; it is an abstraction, with references. Untitled, ca. 1974; oil on wood, 9 11/16 x 22 3/16 x 3/4 in. 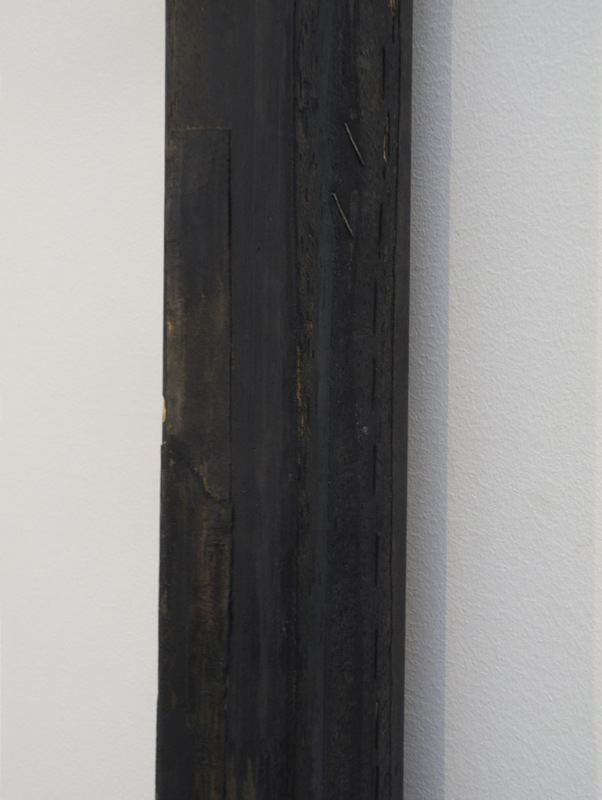 Wood Parallelogram, 1974; varnished wood, 35 9/16 x 22 1/4 x 2 in. ....or a parallelogram, is where the mystery of my deep response to Palermo's work comes most to the fore. There seems to be no reason for me to be so moved by a shape on a wall, but I am. It is as though I am being asked to see the basis of life, its essential form, turned into something poetic; a transmutation of matter. II-1 and II-2, 1974; pencil on paper in 2 parts; 72 1/4 x 93 3/4 and 72 1/4 x 147 7/8 in. In the same room as the Wood Parallelogram were six drawings, most in two parts, that seemed completely empty sheets of paper at first glance. Like a group of Ad Reinhardt paintings shown in this space in 2013, it took attention and time to see what Palermo had done. Like the Reinhardt's, they are impossible to photograph. 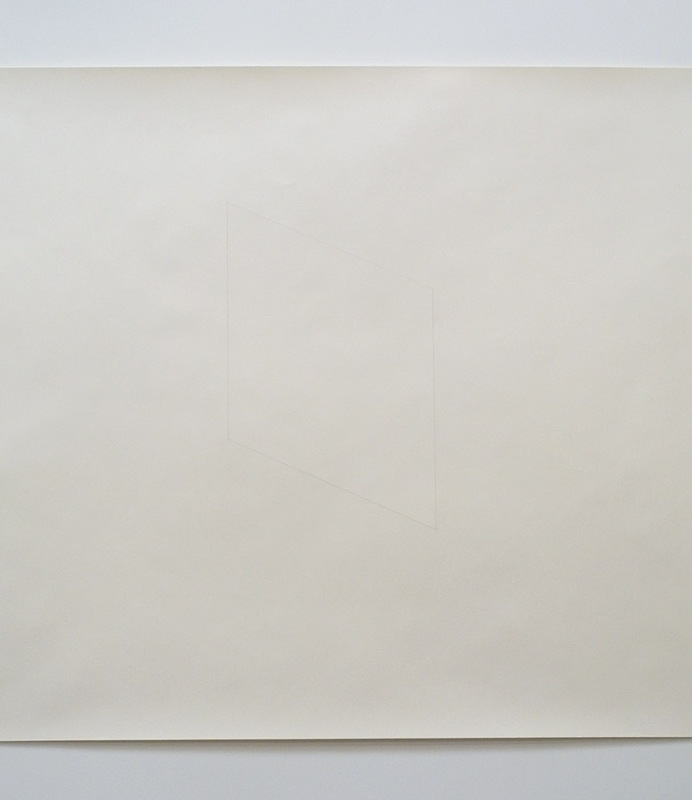 On each sheet of white paper, a surface rich enough to look as though it was painted or gessoed, is one or more finely and crisply drawn parallelograms. They very subtly create a tension between them, a movement across the expanses of empty space. They anchor the space, but with such a light touch that they are almost illusory. They are beauty, hard to grasp. 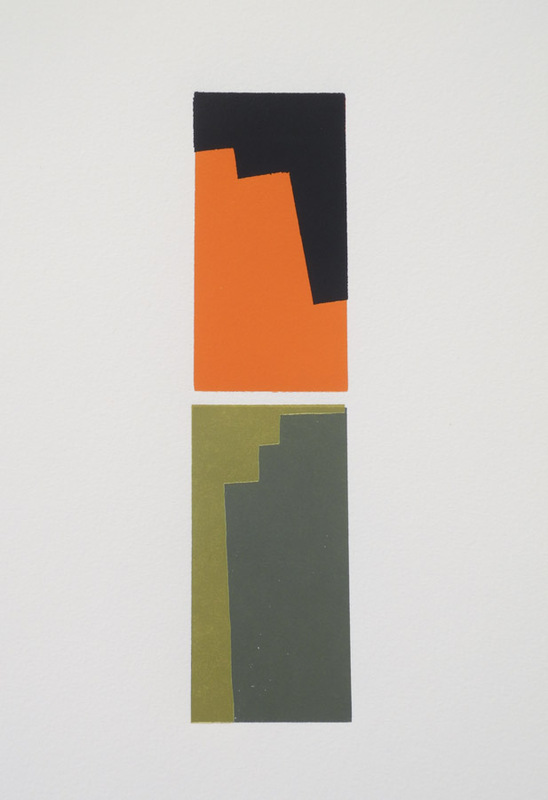 4 Prototypen, 1970; four color screenprints, each 23 5/8 x 23 5/8 in. 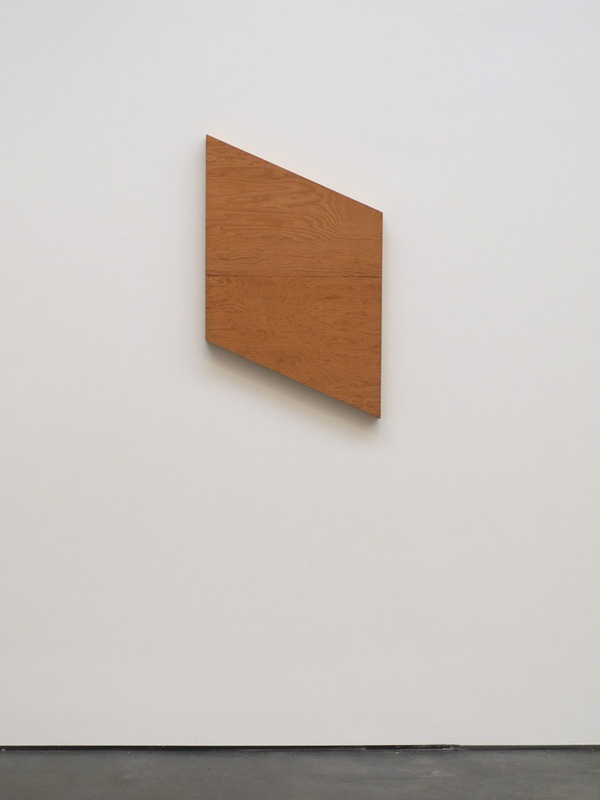 I very clearly remember the first work by Blinky Palermo that I saw: it was the four prints above, and it was at a gallery on the north side of 57th street, sometime in the mid 80s I think. I remember being thunderstruck by this group of prints with their offbeat geometric forms. It was love at first sight, and this was when I was painting precise landscape paintings. It was a treat to see them again, in a show of Palermo prints at Carolina Nitsch Project Room. 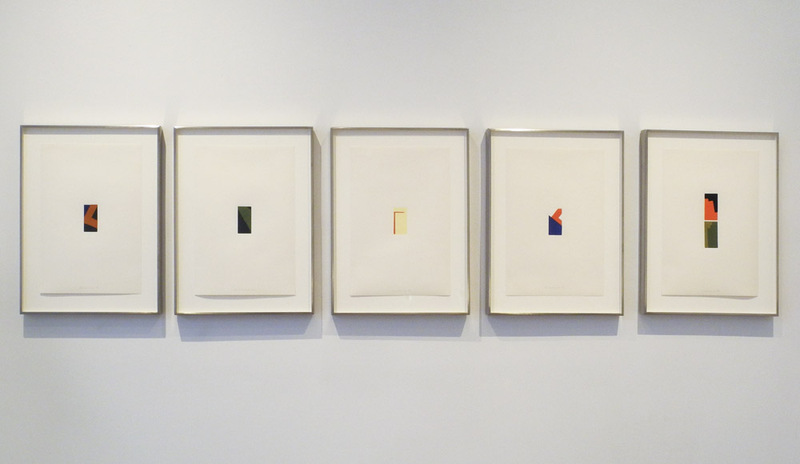 Five Miniatures, 1972; suite of five color stencil prints on handmade paper; each 15 3/4 x 10 5/8 in. In the print show were several suites of miniature prints, which showed another aspect of Palermo's sensitivity to form and color, and his ability to work at different sizes and with different materials. His drawings, which I wrote about here (another show at Zwirner), show another aspect of his marvelous sensibility. 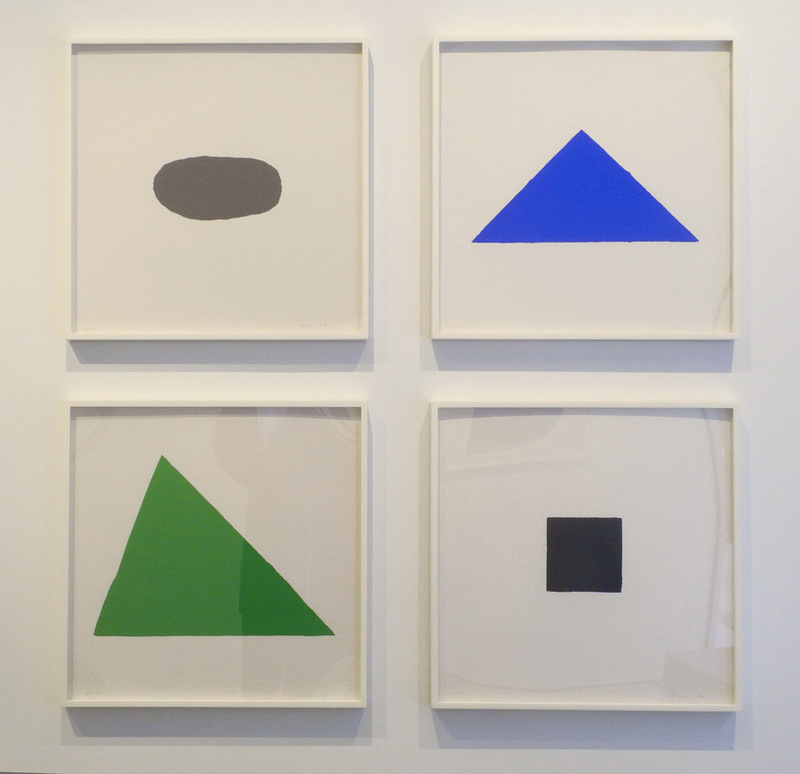 I love these small images, their inventiveness and simplicity; their color and form. There is grace in all Palermo's work, a fluid ease with materials, a mysterious rightness that touches my heart and enlarges my spirit. "What appears from a distance as a clean, crisp form is instead worn and speaks of time and the hand". This sentence gets to what I like about his work. It's like perfect imperfection, a precise arbitrariness. And I do love love love a Parallelogram. Thanks for sharing this. Beautiful writing, Altoon; very inspiring. Thank you. 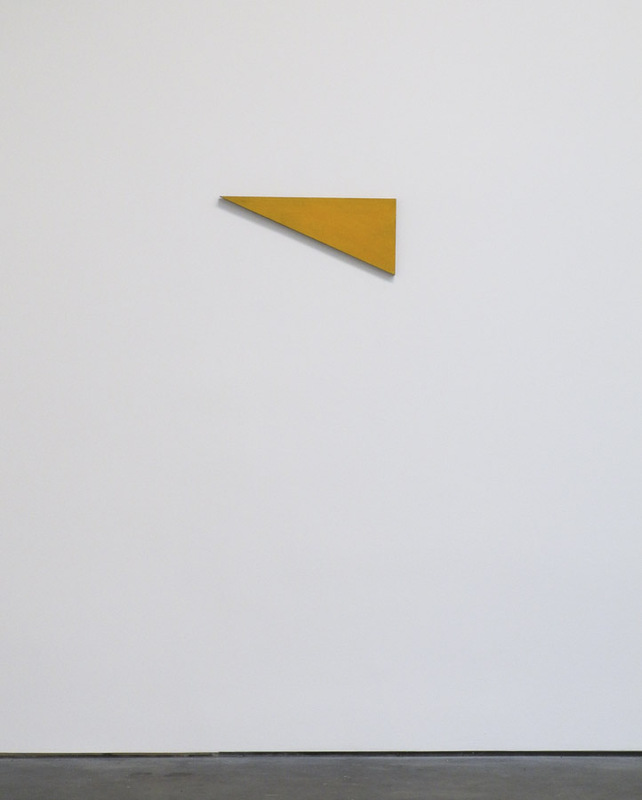 The work of Blinky Palermo is completely new to me and I am fascinated by the apparently aching simplicity - and all so beautifully exhibited in that simple space - wonderful! I'm glad your responded to the work, Charlton. While I know this is lovely work, it just proves to me I am not a minimalist. We can't all be minimalists, Lisa.